We got these chickens piece-meal, a few at a time. We’d never had them before, and started out with five Ameraucanas, tiny week-old balls of fluff… three of which turned out to be roosters. I got Jeanette off an ad in Craigslist; she was supposed to be a Maran, but isn’t. We took the three roosters back to the guy we got them from. We went and got two lovely French Marans. Then one of the Marans got eaten by a raccoon. 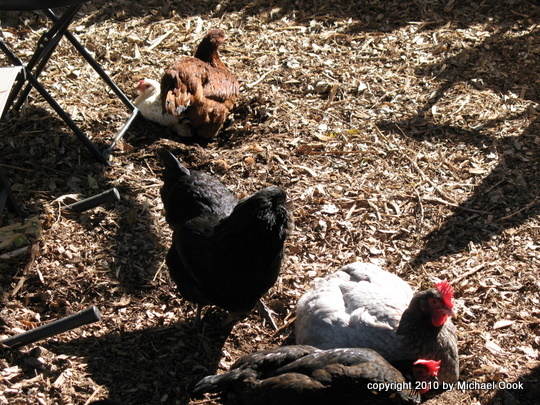 Then we went and got three more: a Rhode Island Red, a bantam, and a funky chicken with spurs and all-black eyes. We’re at a happy number, now – seven seems about the right size for our coop and our yard, although I think it could hold as many as ten. 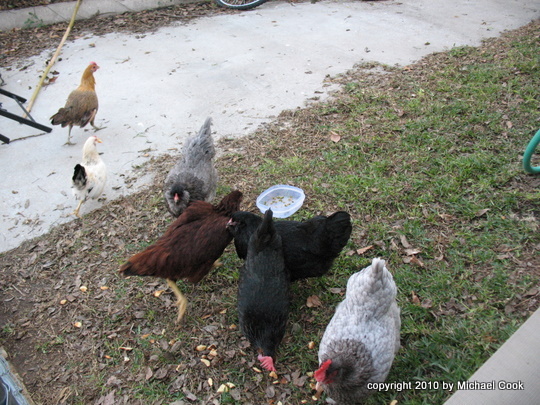 From left to right, they are: Sue Sylvester ( mannish, loud, and blond, of indeterminate parentage), Little Bit, a mixed-breed bantam about the size of a large pigeon, Freebird (Ameraucana), Ruby (Rhode Island Red), Weezy (Ameraucana), Jeanette (supposed to be a Maran, but isn’t), and Ginger (French Maran). This picture is significant for me, because they’re all acting like one flock – there has been a strong division between the older four and the younger three, but hopefully it’s healing. As with everything, tasty treats help lubricate the social machinery – one of the bits of advice we got from Dan at Bageniece Farms (where we got Ruby, Little Bit, and Sue) was to give them treats all together, to encourage social eating. I think Ginger has the best expressions. She looks like she doesn’t take anybody’s crap. 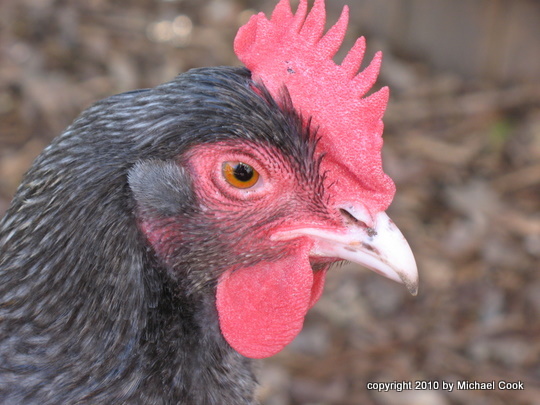 I think the Marans are some of the most handsome chickens. Freebird got her name because she was thrown in as a bonus with the four chicks that we purchased to start with. I love the beards and muffs on the Ameraucanas. They like to “bathe” in dust; it helps to cut down on parasites like lice and mites. This fall, production tapered off as the daylight shortened. I finally figured it out and got a light on a timer set up in the coop; now, they get “sunrise” at about 3 AM so that they can have a natural dusk around 5:30. Right now, we’re getting three to four eggs per day. This is two days worth. 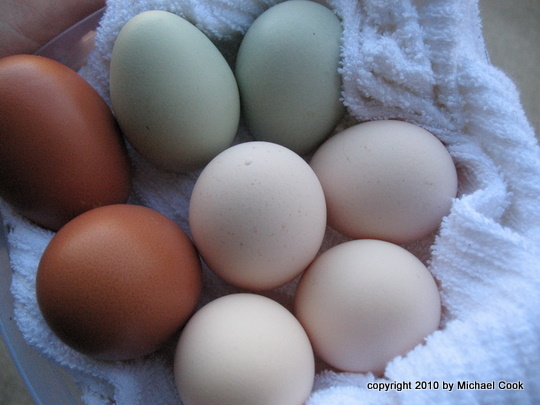 Blue-green eggs are from the Ameraucanas (not sure which one – we’ve never had two green eggs in one day yet, so I don’t think both are laying yet), yellow-off-white is from Sue; pink-off-white is from Jeanette, and the JUMBO brown eggs are from Ginger, the French Maran. The difference between Sue’s eggs and Jeanette’s eggs is pretty slim, but you can tell when you have one next to the other. Sue’s are a slightly golden off-white, while Jeanette’s are a pinkish off-white. 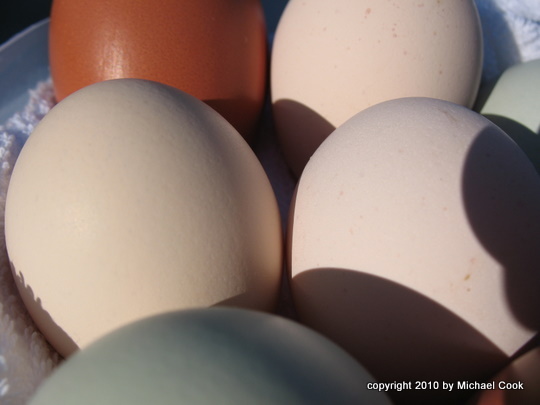 Lovely chickens, lovely eggs! My friend told me about your blog and it’s fabulous! Silk is always interesting but the Chickens…. They are the best! 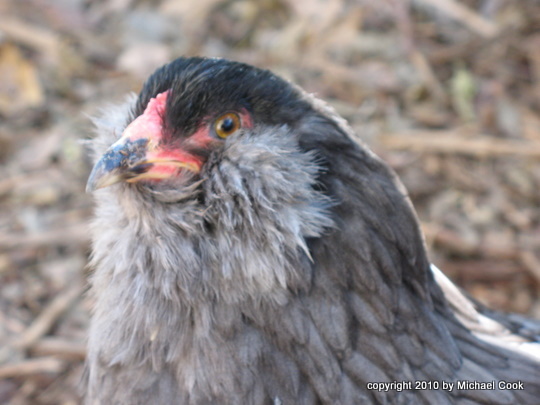 Since I cannot have chickens where I live, I can enjoy them through your blog. Let’s hear it for the Girls.